Stephen Hawking is one of 1,000+ experts who signed an open letter in which they urged that AI weapon systems should be banned globally. Other experts include the likes of Steve Wozniak, Elon Musk etc. From 1970 to 2009 he was the Lucasian Professor Mathematics at the University of Cambridge. Stephen Hawking was born in Oxford, England to parents who were graduates of the University of Oxford. By the end of the 1970s his speech had deteriorated until only a few close friends and family members could understand him so he used a translator to communicate with others. In 1970 Hawking's assertion that the event horizon of a black hole can never get smaller became known as the second law of black hole dynamics. In 1988 he published A Brief History of Time to make cosmology more accessible to the average reader and it quickly became an international best seller. In 2006 Stephen Hawking was invited to Vatican for conference. Pope John Paul was among the audience of Hawking. The Pope was having difficulty understanding Hawking and hence, he knelt down beside the wheel chair of Hawking. This act urged one of the scientists to say “things certainly have changed since Galileo”. In 1970 he became the Sherman Fairchild distinguished visiting professor at Caltech and continues to work there a month a year. In 2009 on June 28, Stephen Hawking threw a party. The party was meant for time travelers only. He sent out the invites after the party was over. Hawking waited for long and no one arrived. In 1973 Hawking's first book, The Large Scale Structure of Space-Time was published. In 2001, a stunning statement was made by Stephen Hawking. He said that if humans are not re-engineered, we may be risking machine rule! Elaine Mason – the second wife of Stephen Hawking – was the wife of David Mason – the engineer who designed the speech synthesiser used by Hawking. In 1974 he was elected Fellow of the Royal Society. In 1950 the family moved to Hertfordshire where his father was head of parasitology at the National Institute for Medical research. Stephen Hawking’s son Tim Hawking used to play pranks on his father when he was just a child. 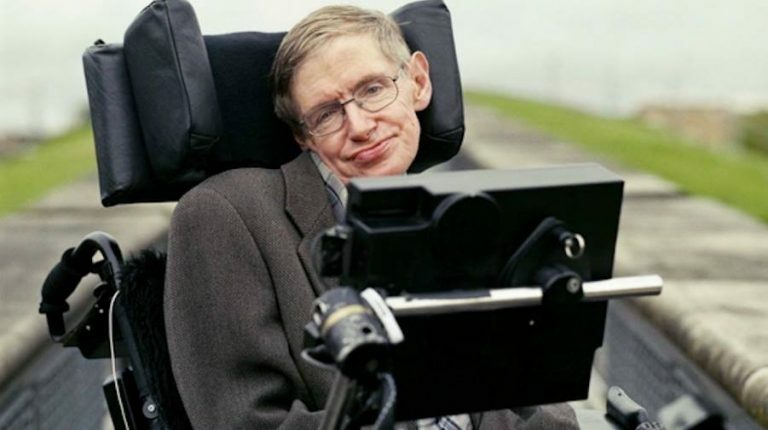 He not only added the word ‘Swear’ to Stephen Hawking’s speech synthesiser but also used his wheel chair as ‘go-kart’! At Oxford when Hawking was in his final year, he fell down from stairs and went to see the doctor thinking that he was becoming clumsier. The doctor advised him only one thing – ‘lay off the beer’. In 1970 Hawking and Penrose published a proof that the universe started as a singularity using the general theory of relativity. In 1976, Hawking was invited for attending the induction of Prince Charles in the Royal Society. Charles was intrigued by the wheel chair of Hawking. Hawking demonstrated the capabilities of his wheel chair by twirling it around and in the process, ran over the toes of Prince Charles. Hawking however regretted that he didn’t get an opportunity of running over the toes of Margaret Thatcher. In 2007, on April 26, Stephen Hawking became the first quadriplegic in world to experience Zero Gravity. He experienced it on a Zero Gravity Corporation flight. Perimeter Institute for Theoretical Physics in Waterloo, Ontario appointed Stephen Hawking as first Distinguished Research Chair. In 1968 Hawking and Penrose published an essay on their theory that the universe might have started as a singularity. In 2004, Stephen Hawking reversed his own theory (given in 1966) that black holes swallow up everything in their own path forever. He declared that black holes can never support space travel into other universes. While there Hawking attended St Albans High School for Girls, later transferring to St Albans School. Stephen Hawking was the person who found out that black holes emit radiations. He found it by combining quantum theory with theory of relativity. In October 1959 he entered University College on a scholarship and began the study of physics and chemistry. In 2005 the device was further adapted to allow him to control it with his cheek muscles since he no longer had control of his hand. He received a B.A with honors in 1962 and began his graduate work at Trinity Hall, Cambridge in October of that year. In 1963 he was diagnosed with a rare form of amyotrophic lateral sclerosis that is characterized by an early-onset but slow progression. Hawking strongly believes that time travel is possible with our current understanding but says that there has to be Chronology Protection Law in place to prevent time travelers from traveling back in time and killing their parents. He was fiercely determined to be independent and it wasn't until the late 1960s that he consented to use a wheelchair. When Hawking was in his teens, he built a computer from recycled parts. Of course, he took help from several of his friends. The computer he built along with his friends was used for solving rudimentary mathematical equations. The 1965 doctoral thesis of Stephen Hawking was posted by Cambridge University on its website in October 2017. The demand for the paper was so high that university’s website was overwhelmed by visitors and the server crashed! In 1985 he contracted pneumonia during a visit to the European Organization for Nuclear Research and the tracheotomy he had to have to breathe removed the last of his speaking ability. He is currently the director of research at the Cambridge University Department of Applied Mathematics and Theoretical Physics. In 2006, Hawking publicly advocated the colonization of other planets by humans. At the same time he also expressed his wish to go into space and joked that billionaire Richard Branson will help him. Guess what? Richard Branson paid for all the expenses for Hawking’s 2007 zero-gravity experience! In 1966 he earned his PhD in cosmology with a thesis on singularities and black holes. Back in 2006 when Hawking was in Vatican for cosmology conference, Pope John Paul II discouraged him from studying the universe stating that the origin of the universe was God’s work and it shouldn’t be explored. When Hawking was in school, his friends gave him the nickname – ‘Einstein’. His co-authored a paper with Roger Penrose titled, "Singularities and the Geometry of Space-Time," which earned that year's Adams Prize. US President Barack Obama awarded Stephen Hawking with Presidential Medal of Freedom in year 2009. He received a research fellowship at Gonville and Caius College. In 1993 he published a collection of essays entitled Black Holes and Baby Universes and Other Essays. In 2007 he and his daughter, Lucy, collaborated on a children's book titled, George's Secret Key to the Universe.